On Monday evening social media users started to post footage of an intense fire engulfing the medieval Catholic cathedral, Notre Dame, which is situated in the centre of Paris. The fire reportedly began at around 6:50 pm local time, according to the Paris fire department. AFP reported that the fire may have been started accidentally during renovation work underway inside the cathedral. While many were frustrated at the fact the firefighters would not use aerial means to put out the fire that was consuming the national heritage, the firefighters themselves explained that they feared that dumping such huge amount of water on the centuries-old building could cause its collapse. "Dumping water on this type of building can indeed lead the entire structure to collapse," the Pompiers de Paris tweeted. 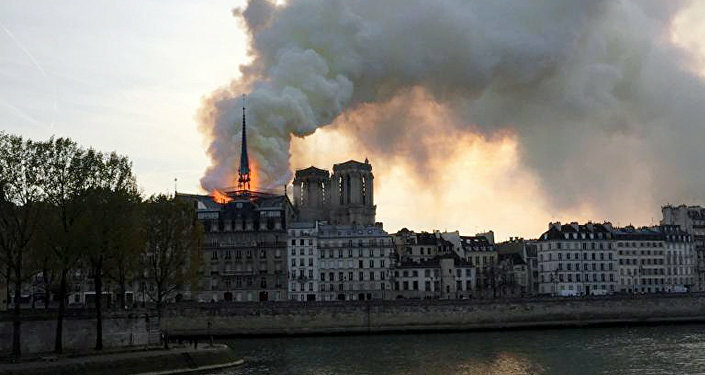 Despite the fact that the cathedral suffered significant damage, the main structure of the building, which is made of stone, has been preserved, Paris fire chief Jean-Claude Gallet told reporters at around 20:50 GMT on Monday. "We believe [we] were able to save two towers of the cathedral… We believe that the structure of Notre Dame has been saved and preserved," Gallet told BFMTV. Several hours later, a spokesperson for the Paris fire brigade, Lieut. Col. Gabriel Plus, said the fire had finally been extinguished. "All the fire has been extinguished. The expertise is now underway," the official said, as aired by the BFMTV broadcaster. No evidence of arson has been found, Paris Prosecutor Remy Heitz said Tuesday. According to Heitz, about 50 investigators will work on the case to determine what caused the blaze. "We must, of course, wait for the results of the police investigations that were launched immediately, as the fire was still raging in Paris. It is always possible that the fire was an act of vandalism or even of terrorism. The workers had left the building at 5 p.m. [15:00 GMT], and the fire started at about 6.40 p.m.," Claude Moniquet, a former intelligence agent at the French Directorate-General for External Security, told Sputnik. Moniquet, who is currently at the helm of the European strategic intelligence and security center think tank, remarked that there had been a failed bombing attack targeting the famous cathedral. A car loaded with explosive materials was found near Notre Dame in September 2016. Several people were arrested in connection with the plot. "But in this instance, I believe it was a real accident. Often repairs of castle roofs, for example, result in a fire, due to the works. At Notre Dame, in the few days prior to the fire, they had started disassembling statues to bring them down for restoration and had used welding equipment. It is very dangerous on a roof which heats up under the sun and of which the wood is very very dry. You can also always have a short-circuit in electrical equipment, such as the two lifts installed on site for the works," Moniquet said. 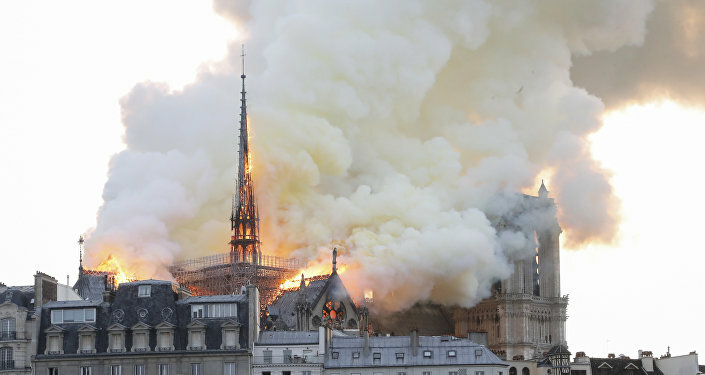 Olivier Ribadeau Dumas, the spokesman for the Bishops' Conference of France told Sputnik that the French government should restore the Notre Dame cathedral as soon as possible. "I hope this [the reconstruction] happens as soon as possible. This monument is a part of France's heritage. The state should take care of its reconstruction and the Catholic Church and all the French will help it," the spokesman said. Michel Picaud, the president of the Friends of Notre-Dame of Paris Foundation, told reporters a few hours after the start of the fire that the restoration of the iconic cathedral could take at least a decade. "The renovation program began last year and was expected to last about ten years… Taking into account the damage which occurred today, the restoration will take, in my opinion, at least 10 years with a redoubled effort," Picaud said. The French heritage foundation has already launched a fund-raising campaign to help rebuild the landmark cathedral. French billionaire Francois-Henri Pinault has, in turn, pledged in a statement to donate together with his father as much as 100 million euros (over $113 million) for the reconstruction of the cathedral. Patrice Bernard, who leads Carpenters in a famous French centuries-old association of craftsmen and artisans, "Compagnons du Tour de France," has described the great work that went into building the cathedral. "The ‘forest' that the roof of Notre Dame represented, covering the whole nave, was huge and composed of trees much older than 100 years, when they were felled 850 years ago and brought to the island of the City in Paris to build the cathedral. You can imagine it was quite difficult at the time to raise these beams to the roof of the monument. Notre Dame had kept nearly all its original roof structure in oak, which was assembled without metal," Bernard told Sputnik. Bernad added that carpenters of the time would often use deformations in tree trunks to make bent parts. "The carpenters of 1150 were great craftsmen!… We can do it again or repair such structures, but it will take a very long time, decades, and we need first to select an oak forest where the trees have grown at the same time and have the same characteristics. What happened is a disaster, shocking for us professionals of carpentry and specialists of restoration, because we know the time it takes to build such perfect structures," Bernard said. Benoit Van Den Bossche, a professor of Art History, specializing in the Middle Ages, at the University of Liege in Belgium, expressed concern over the stones of the cathedral. "I am worried that the stones of the Gothic vaults are very damaged by the incredible fire on top of it. Stones don't burn of course, but can be very damaged by fire. The Gothic arched roof must be in a very bad state, and might need to be disassembled to be rebuilt. It is a tragedy," Van Den Bossche told Sputnik. However, the art historian stressed that history had seen examples of cathedrals rebuilt — in Chartres, Reims, Liege.